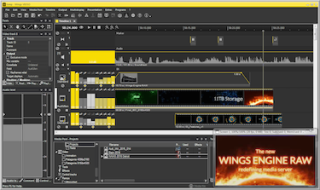 AV Stumpfl is launching its Wings Vioso RX software. Aimed at quick and easy adoption by existing users, the familiar user interface has been given a facelift with several performance and feature optimizations. The render engine is based on x64 architecture and includes several base level algorithms, replacing standard operating system and driver functions. A key feature introduced in the engine is AV Stumpfl’s proprietary multiple master workflow. In real-time, multiple operators can collaborate remotely on projects using the same media server outputs. For example one operator can control background projection whilst another can add overlays or add or change content live at runtime, even whilst the show is running. AV Stumpfl has updated their media server portfolio to include a range of products starting from entry-level media servers for fixed installations up to AV Stumpfl’s flagship product, Wings Engine Raw. All servers include Wings Vioso RX software. The new Wings Vioso RX is backed up by AV Stumpfl’s extensive sales and service support team.